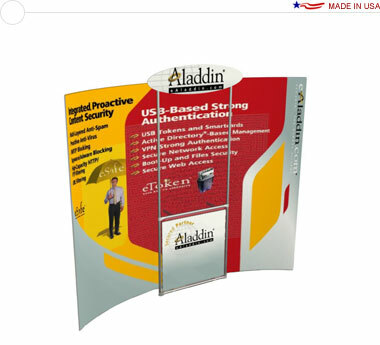 This Entasi™ configuration features a 10′ × 8′ horizontal curved backwall booth covered with a tension fabric printed with your own graphics. Also included is a straight stand off with bottom graphic, a shelf, and a large oval header graphic. Entasi™ is one of the most attractive portable trade show display systems available today. It combines a solid frame with beautiful graphics printed on Green Knit tension fabric, and offers an extensive array of accessories and options. The flat shipping rate for this package is $109.25 USD for standard delivery within the continental United States. Alternative shipping methods and International shipments are available; please contact for a quote.